Graduate School of Public Policy held an orientation day on 6 August 2018. Vice provost for academic affairs Loretta O’Donnell and GSPP Dean Weng Tat Hui of Nazarbayev University welcomed new students at the orientation session. 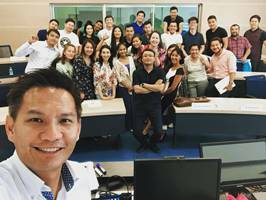 GSPP 29 MPP and 21 MPA students headed off to Singapore on 10 July 2018 within the frames of GSPP Singapore component. The first part of the MPA course on “Accountability, Financial and Performance Management” took place on 15 June – 24 June 2018. 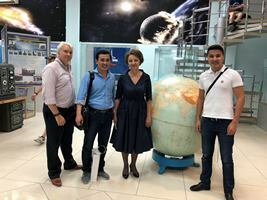 On 6 June 2018 a team of graduate students, Ilyas Khangozhin, Bakhyt Zhekey, Aidos Koldasov and their faculty supervisor, Assistant Professor, Dr. Michael Waschak from the Nazarbayev University Graduate School of Public Policy (GSPP), traveled to the Baikonur Cosmodrome to observe the successful launch of the Soyuz MS-09 mission to the International Space Station. 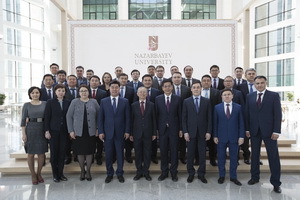 Prof Lim Siong Guan came to Astana on 28 May 2018 at the invitation of the Graduate School of Public Policy, Nazarbayev University. NU Graduate School of Public Policy conducted a training program for Nur Otan Party on Transformational Leadership. How to make a policy entrepreneur from a civil servant? Prof Colin Knox and Prof Saltanat Janenova gave interviews in Khabar TV programme "Bureau of Investigation" on the topic of 'Ethics in Civil Service' along with other local experts and officials. The "curse" of e-government in Kazakhstan? 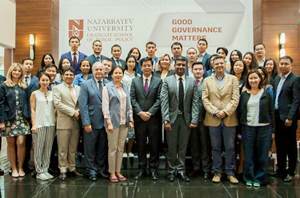 GSPP Prof Saltanat Janenova joined the newly established Advisory Council of the Agency of the Republic of Kazakhstan for Civil Service and Anti-Corruption Affairs. 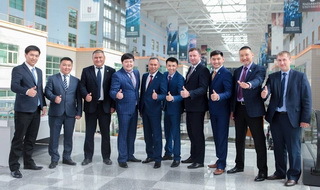 World-class education at the Graduate School of Public Policy, Nazarbayev University. Public councils in Kazakhstan: a case of emergent participative democracy? ‘Ethics in Civil Service: “presumption of innocence”, mentality and mission impossible? Эволюция ЦОНов: от граждан для правительства к «Правительству для граждан»? Kazakhstan’s African Policy: What Lessons to Learn on Both Sides? Международная научно-практическая конференция "Н.Назарбаев и казахстанская модель государственной службы"
Торжественная церемония открытия нового корпуса Назарбаев Университета состоялась в столице.